The Great Misdirect isn’t the BTBAM you’re used to. Colors serves as an ok transition from Alaska to The Great Misdirect but with their newest offering, BTBAM have gone into full prog-metal. Where Colors bored me, The Great Misdirect has grown and been an interesting listen every time through. It feels less like a metal record to me and more an album about creating music and pushing musical boundaries and challenging themselves musically. And they’ve accomplished that. The albums opens with Mirrors, a jazzy, slow song with a killer bass line that grooves you into Obfuscation which is the only track on the album that is most reminiscent of earlier era BTBAM. I really Alaska/Colors feel for the first half of the track. The breakdown is, again, really groovy and moving. The bass work on The Great Misdirect as a whole is fantastic. Disease, Injury, Madness has moments of Colors era BTBAM and yet moves away from that into more of the progressive style Mastodon has recently played with and into a realm completely different. Fossil Genera – A Feed From Cloud Mountain is their take on a crazy metal carnival that moves all over the place. Desert of Song is the ballad of the record, an acoustic track that might stand out, except that the whole record to this point has been all over the map and has defied genre that you just accept it as a good song. The albums closer. Swim to the Moon, is an epic 18 minute journey through everything BTBAM has brought you so far. It’s hard to be mad with 6 songs when the songs average a length of 11 minutes and cover so much ground and is so interesting, far more interesting then anything else in metalcore. The Great Misdirect is an epic masterpiece. 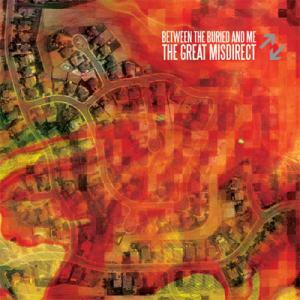 It’s on a different level, and although I love Alaska, The Great Misdirect might be my new favrotie Between the Buried and Me record.